Anchor gear needs to keep you in the chosen position whatever nature throws at you. A dragging anchor puts boat and crew in immediate danger. The whole caboodle, often called ground tackle, consists of an anchor winch, a sufficient length of chain and an anchor. Many different types of anchor are in use and recommended for different bottom types but what one needs is an all-round reliable anchor. Most anchors nowadays are of the spade or plough type. 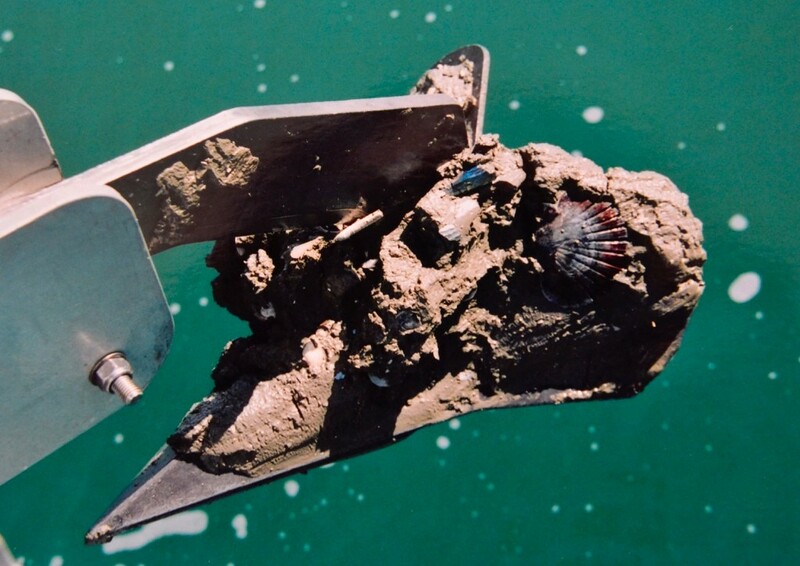 The spade type of anchor is praised by their users as an all round anchor that digs in quickly and resists breaking out just like spades. Popular brands are the Manson and Rocna which look better than, but are basically a development of the German Bügel anchor which has been around since the 1950th. The plough anchor may fit more easily on the stem roller but the spade has better holding capabilities simply because it does not plough. 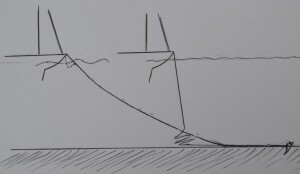 The strain on the ground tackle depends on the weight of the yacht as well as the windage mostly caused by rolled up head sails and the wind and subsequent wave conditions. Yachts at anchor can veer violently from side to side trying to uproot the anchor. Here is where not just the weight of an anchor but the area and shape of the flukes is most important. 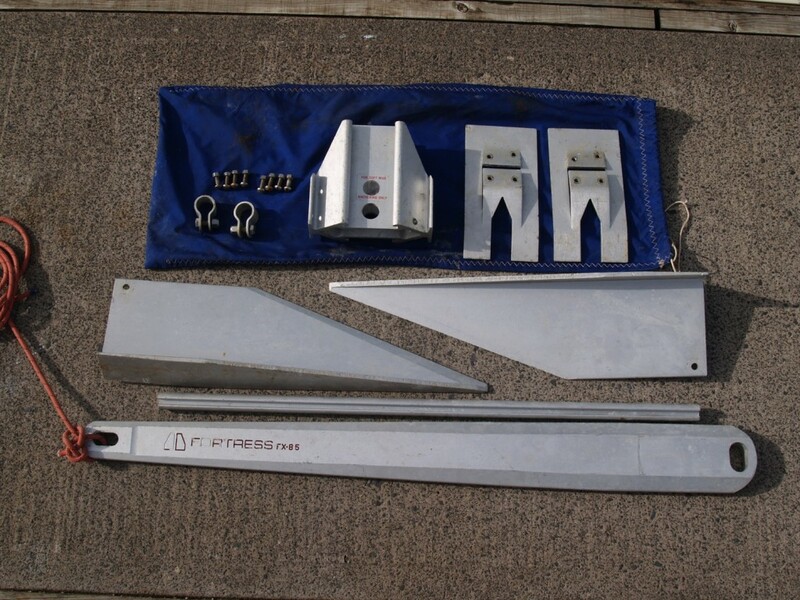 The photo below shows a 40 kg Rocna anchor which kept a 56 foot 27 ton yacht with two rolled up head sails in its place in winds over 60 knots and waves of 60 cm high. The Rocna was hardly retrievable after the storm abated so deep was it buried in the clay bottom. The tip on this shaft was later welded on to make the anchor sit tight on the roller. A smaller anchor, also of the spade type, easy to stow and light enough to handle by hand would come in useful as a stern anchor sometimes used to keep a yacht at a right angle into waves or to limit the swinging circle in a very crowded anchorage. At least one spare anchor capable to replace the main anchor should be on board. A collapsible Danforth type anchor, such as the Fortress, would be a good choice. It is light and when taken apart doesn’t take up much space and is very effective being of the spade type for starters. A full length of chain for the anchor rode is preferable to a chain warp combination. Given enough depth in the chain locker it is self stowing and doesn’t chafe on the anchor roller. For yachts up to 15 tons 10mm chain of good quality and for heavier yachts 12mm chain seems to be the going rate. Make sure the chain size fits the gypsy. Some 70 meters of length is sufficient for most yachts under 20 tons. Hundred meters of chain would be ample even for anchoring at Easter Island but probably difficult to stow in the chain locker. 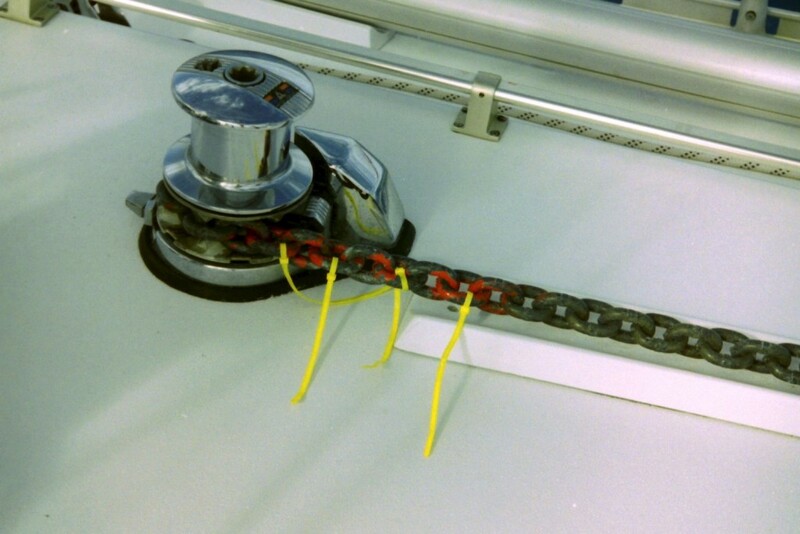 A spare length of chain, some 25 meters, would be advisable and could be spliced on a nylon warp in case of loss of the main chain or for use with a stern anchor. The bitter end of the chain should be tied with a strong rope to a sturdy point inside the chain locker to avoid an embarrassing total roll out. 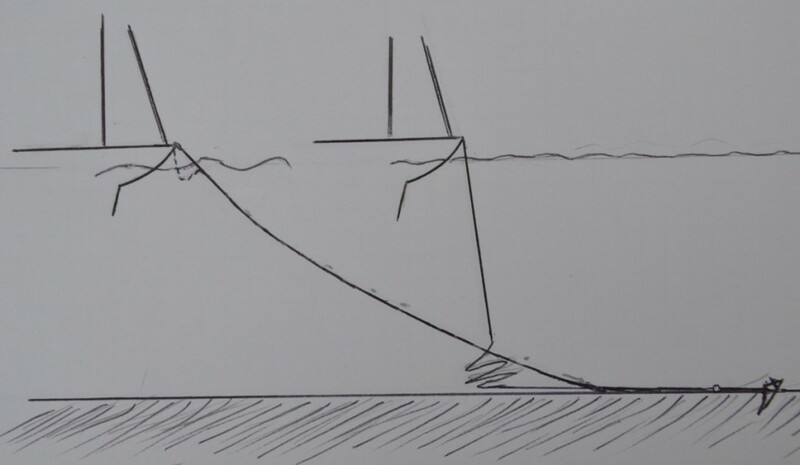 The amount of chain deployed for anchoring depends on the depth at high water when anchored and the conditions such as wind and waves. One should deploy at least 5 times and under windier conditions 7 times as much chain in the water as the depth at high water. But even at shallow spots let out a minimum of 25 meters. Make sure enough length of the chain always lies under all conditions horizontally on the seabed or the anchor will be pulled up and out. The connection between chain and anchor should ideally be a heavy duty swivel connector. The swiveling of this connector type prevents the chain to kink and it pulls easily over the bow roller whereas a shackle can get caught. When at anchor one doesn’t want the rumble of the chain on the roller or the shock loading caused by veering sideways of the yacht. For that one uses a snubber, a chain hook on a 4 to 5 meter length of heavy nylon 3-strand mooring rope which will act as a suspension against the shocks and equipped with a good protection of the nylon line, e.g. a heavy duty hose, against chafe will guarantee a quiet night. Just clip the chain hook on the chain and tie to a strong cleat and let more chain out till the yacht hangs on the nylon rope. This takes the load off the anchor winch. The aim should be always to have some length of chain on the bottom to prevent pulling up and out the anchor. An electric anchor winch is a must, a manual winch would be a pain. Hauling in a chain and anchor by hand is back-breaking and only feasible on the smallest and lightest of yachts. Depending on the available height inside the chain locker one can choose a horizontal or vertical winch. The vertical winch, one with the motor below decks inside the chain locker, with or without a capstan, is the most popular type. The motor below deck which restricts the available space in the anchor locker often necessitating flaking of the chain when weighing anchor. For that one needs deck access to the locker. The next choice is of a winch that lets the anchor go out in free fall or one with dual direction, winding the chain in and out with the motor. Winches with capstan can do both, free fall or wind out the chain. It pays to have enough power and speed to pull the chain out of the locker since the chain heap may have fallen over when sailing and pulling buried chain from underneath a heap can be difficult. Do not skimp on winch power but realize that during hauling in under heavy load a very high current will be drawn from the battery bank which must be capable of delivering this current. Then the choice of control(s). Foot switches near the winch on the fore deck is mostly standard but a second set of panel switches near the steering wheel is advisable. Not just for single-handers but also for mooring Mediterranean style backwards onto a pontoon or pier. Another 40 kg of clay will test the winch. The anchor winch should be capable of bringing up a heavy load of chain and anchor sometimes made even heavier with a spade anchor full of bottom clay. A provision should be available to use the winch by hand just in case electrics fail. 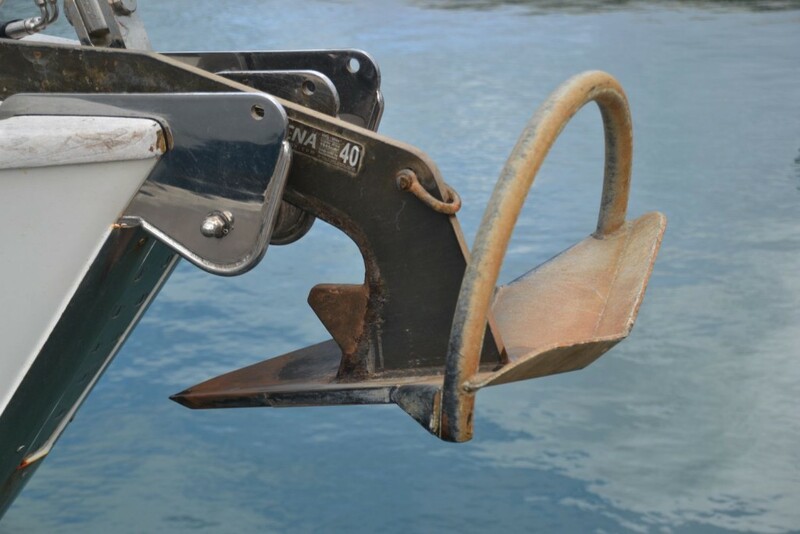 The load on the winch when weighing anchors should be eased by slowly motoring little by little up towards the anchor location whilst operating the winch. With the chain comes sometimes mud or clay which one would not want in the chain locker. A set-up of a hose connected to a high pressure pump to spray off the mud from chain and anchor with salt water could be useful. Note the marked chain with paint and cable ties at 40 meters and the asymmetric winch hole socket in the capstan to winch the chain by hand when the electric motor fails. Sown on canvas strips not easily removed by the gypsy hold better than cable ties. The gypsy mauls cable ties after some time. Paint marking is also useful.